CS-1, Other effects bundle or multi-effect from Universal Audio in the UAD Plug-In series. Universal Audio CS-1 is actually a variety of plug-ins all in one channel strip including an equalizer/compressor, delay, and reflector. I didn't have any issues installing the plug-in as it only took a few minutes and I didn't have any compatibility problems or any other problems otherwise. You do have the process of installing the hardware that this comes with (either the UAD-1 or UAD-2), which can take a little bit of time. However, the interface of the software is user friendly and straight forward as you can take pretty much everything you see for face value. 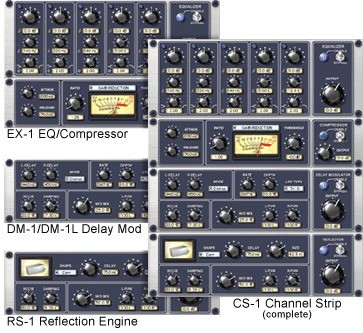 The EQ has five bands, each with parameters for gain, frequency, and bandwidth. The compressor has parameters for attack, release, ratio, threshold, and output. While it would take too long to list the other sections parameters as they are a bit more in depth, the point is that the parameters will be familiar to experienced users. I haven't seen the manual for this plug-in, but it is easy enough to use that I don't think one is necessary. The system I have run this plug-in on is a Pro Tools HD based system that runs with an Apple G5 computer and a Digidesign 192 I/O interface. While I can't say that I'm able to run endless amounts of channel strips within a single session, you do get the option of using each section of the channel strip as its own plug-in, which takes up a lot less processing power and is the way that I usually go with this plug-in. Since this runs in tandem with the card, all of the processing power is taken off of the computer, which puts a lot less stress on all of your sessions. Anyone running this plug-in is running it with the card, so no one should be having too many problems in terms of performance with this plug-in. I've been using Universal Audio CS-1 for about a year and I can't say I have any complaints about this plug-in. In general I'm a big fan of the UAD cards and the plug-ins that can be run with them as they save processing and sound great. 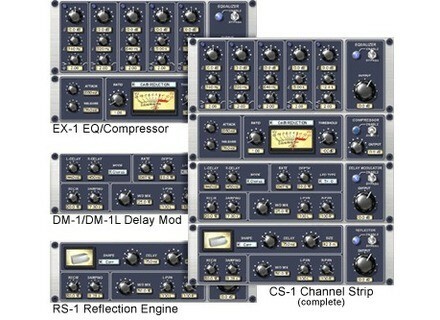 This is a versatile channel strip with a lot to offer both home and professional studio owners. The total price of this plug-in along with a UAD card is pretty reasonable, and definitely worth it for those looking to build upon their plug-in collection with Universal Audio plug-ins and want to save processing power. This does come free with a number of the cards if not all of them, and the entire package is overall a great investment for any studio.